There is, without question, a public health crisis in the United States arising from both illicit and prescription opioid misuse, addiction, and overdose. The Food and Drug Administration (FDA) is one regulator with an important role to play in minimizing the harms associated with prescription opioids, while also ensuring that prescription opioids are available for the evidence-based management of pain. One question, however, is to what extent the agency can consider in its decisions to approve opioids and keep existing ones on the market the provider and patient behaviors contributing to the epidemic. This is, in part, because FDA’s approval of drugs is often understood as narrowly focused on weighing the benefits and risks of the products as defined in the preapproval clinical trials that are used to set the drug’s official FDA-approved indication. Such a limited focus would exclude important information about the real-world use and public-health impact of prescription opioids and other drugs with externalities. This Article argues that, to better regulate drugs like opioids that have such externalities, one step FDA should take is to use a “public health” perspective in its approval (and withdrawal) decisions. 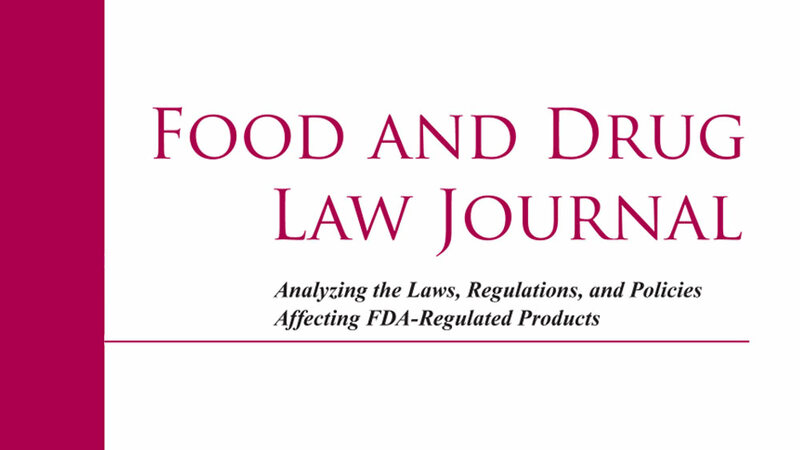 The Article describes how the federal Food, Drug, and Cosmetic Act authorizes FDA to take this broad approach in its drug approval and withdrawal decisions and offers some principles for implementing this approach systematically. How Might Manufacturers of E-Cigarettes Get New Product and MRTP Orders from FDA More Quickly and Easily? Federal Trade Commission v. Quincy Bioscience Holding Company Inc.
Nicopure Labs, LLC v. Food and Drug Administration et al. Singleton v. Fifth Generation, Inc.
Should FDA Try to Move Smokers to E-Cigarettes and Other Less Harmful Tobacco Products and, If So, How? Genomic Malpractice: An Emerging Tide or Gentle Ripple? Is the Incorporation of the United States Pharmacopeia into the Food, Drug, and Cosmetic Act an Unconstitutional Delegation of Legislative Power? How Can FDA Address the Opioid Addiction Crisis? How Can Global Markets Establish and Implement Efficient, Flexible, and Effective Global Pharmaceutical Serialization and Traceability Systems?